Home / Posts tagged "George McPhee"
Former Capitals general manager George McPhee will be honored in ceramic form ahead of Bowling Green’s next hockey game. Bowling Green will hand out George McPhee player/executive bobbleheads to the first 500 fans attending the Falcons’ game against the Alabama Huntsville Chargers on Friday. McPhee is a Bowling Green alumnus and Hall of Famer. McPhee won the Hobey Baker Award as the NCAA’s best college player in 1982 before playing parts of seven seasons in the NHL. LAS VEGAS — Defenseman Nate Schmidt scored 36 points in the 2017-18 regular season, his first with the expansion Vegas Golden Knights. Schmidt, 26, had totaled 41 points in his previous 200 NHL games — all of them with the Washington Capitals. In 2013, Schmidt was plucked from thin air by then-Capitals general manager George McPhee who thought the undrafted free agent had the potential to be a standout, top-pairing backstop after four years at the University of Minnesota. McPhee did not get to see his flower bloom. He was kicked out of town by Capitals owner Ted Leonsis a year after signing Schmidt. 227 days after its franchise’s first ever regular season game, the Vegas Golden Knights are going to the Stanley Cup Final. Sunday afternoon, the Golden Knights defeated the Winnipeg Jets 2-1 at MTS Centre, becoming the third franchise in NHL history to play for a championship in its inaugural season, joining the Toronto Arenas in 1918 and St. Louis Blues in 1968. The victory also continues a redemption story for former Capitals general manager George McPhee and the Knights’ first pairing defenseman Nate Schmidt — a frequent scratch of Barry Trotz despite numbers that suggested he was a top-tier NHL D-man. The surging Pittsburgh Penguins just landed a useful asset ahead of the February 26 trade deadline and they got a lot of help from former Capitals general manager George McPhee. After the NHL nixed a deal earlier in the evening, the Penguins, Senators and Golden Knights completed a complex three-team trade around 9:30 pm. The Penguins landed center Derick Brassard, a 2018 third-round draft pick, and prospect forward Vincent Dunn from the Senators and prospect forward Tobias Lindberg from the Golden Knights. Meanwhile, the Senators received goaltending prospect Filip Gustavsson, defenseman Ian Cole, and a 2018 first-round pick and a 2019 third-round pick. The Golden Knights got tough guy Ryan Reaves and a 2018 fourth-round draft pick in return. Vegas will also retain 30% of Brassard’s salary even though he will never play a game for them. According to Sportnet’s John Shannon, who first reported the TJ Oshie extension last summer, the first-place Golden Knights got involved so that Brassard would stay out of the Western Conference. As the Capitals continue their mediocre play, the team’s GM, Brian MacLellan, was up in Montreal for the NHL’s Centennial celebrations. The NHL was officially founded on November 26, 1917 at Montreal’s Windsor Hotel. The NHL’s 31 GM’s all met there and took a photo together this morning during one of their yearly meetings. It was a cool moment. Check out who MacLellan was sitting by. Forward Vadim Shipachyov scored a goal in one of the three games that comprised his entire NHL career, and then he was gone. On October 24 the Vegas Golden Knights assigned him to their AHL affiliate in Chicago, but the player did not report and soon after retired from North American play. He has since signed with SKA in the KHL, and we’re still sorting through the wake of his exit. On Saturday morning, KHL reporter Aivis Kalniņš‏ finally shared Shipachyov’s side of the story. Washington Nationals outfielder Bryce Harper watched a hockey game Tuesday night, but it was not in support of the Capitals. The Las Vegas native, who pledged his allegiance to his hometown team back in February, finally took in his first hockey game at T-Mobile Arena. The first-place Golden Knights were playing the Chicago Blackhawks. Before the game, Harper posed with former Capitals general manager George McPhee. LAS VEGAS — One year ago, there was a secret announcement before the 2016 NHL Awards. Your correspondent and other reporters gathered in a ballroom in the Encore Resort and Casino awaiting news we already knew. 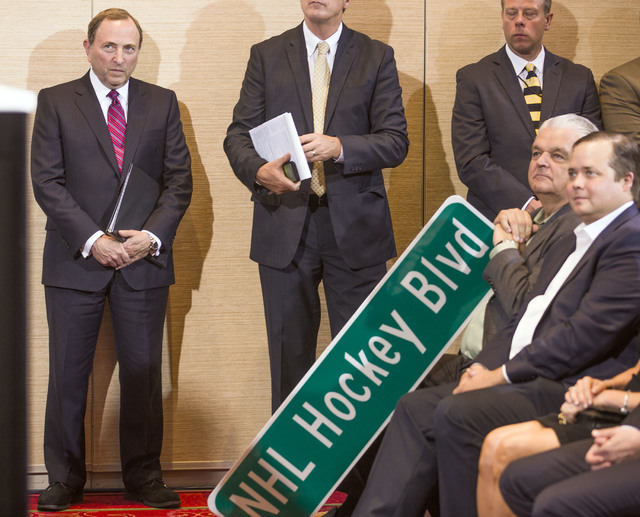 After waiting a while, NHL Commissioner Gary Bettman, businessman and financier Bill Foley, and a giant street sign reading “NHL Hockey Blvd” emerged from a door on a right. Las Vegas had a hockey club, becoming the 31st franchise in the league. A year later, they’ve turned that franchise into a hockey team, selecting 30 players from each of the other organizations in the NHL during a televised production of the 2017 NHL Awards. Editor’s note: It feels like the Caps have been cursed for forever, but one reader believes that jinx is over. Mike Callow, a producer and co-host of ESPN 980 programming such as The Bram Weinstein Show and Inside the Locker Room, writes why things may finally be looking up for the Capitals. You can follow him on Twitter. Take it away, Mike. As a lifelong DC Sports fan, there’s one thing I know for sure. For whatever reason, this area is cursed come playoff time and the team that suffers the most is the Washington Capitals. I’m here to tell you though, that on Saturday night, the curse on the Washington Capitals officially ended. In Elliotte Friedman’s latest 30 Thoughts column, the Sportsnet journalist revealed what could have been a very interesting addition to the Vegas Golden Knights. According to Friedman, General Manager George McPhee wanted Dale Hunter back in some capacity with the team.